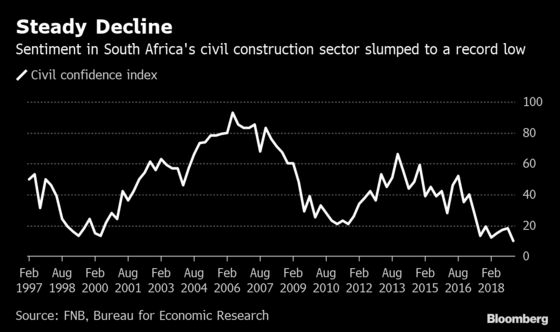 (Bloomberg) -- Confidence in South Africa’s civil construction sector is at the lowest in at least 22 years and could stay there for some time. A gauge tracking sentiment in the sector dropped in the first quarter to the lowest since its inception in 1997, according to a statement Tuesday by FirstRand Group Ltd.’s First National Bank and the Stellenbosch-based Bureau for Economic Research. That means 90 percent of participants in the quarterly survey are unsatisfied with current business conditions. That’s consistent with market developments following the “demise” of construction company Group Five Ltd., said FNB property economist Siphamandla Mkhwanazi. Group Five filed for bankruptcy protection earlier this month, making it the fifth local builder to enter business rescue in less than a year. The company’s shares were suspended after 45 years of trading on the Johannesburg Stock Exchange. While the building industry is cyclical, the current mix of a depressed economy, high levels of government debt and a widening budget deficit is proving toxic as contracts dry up. President Cyril Ramaphosa announced plans to create a multi-billion rand infrastructure fund last year in a bid to get financing from both private and state-owned companies to boost the industry. The construction sector, that makes up about 4 percent of gross domestic product, is yet to see tangible benefits.